Invented in 1984, PowerPoint is the public-speaking software used everywhere from the classroom to the board room, but it is often not used well! Your research should be complete. You should have a story map or a note card for each slide which includes title, text, sequence, placement of graphics and narration text. Choose a template design that harmonizes with your theme. Be sure there is good CONTRAST between words and background. Have just ONE IDEA and a few supporting facts on each slide. There should be one focal point. Use the "Rule of Thirds". Use just one or two fonts, and be sure it is large enough for people in the back of the room. Choose powerful images; use original art or your own photographs if possible. Apply artistic criteria to each slide: balance, proportion, harmony, RESTRAINT, originality. Keep animations simple. Coordinate the timing of your talk with the animations. Understand your audience and you will be more likely to reach them with your ideas. Make eye contact with your audience and speak with conviction. Remember that the best presentations do more than just present information; they challenge the audience to think. Don't get carried away with special effects and animations. Good designers believe that LESS IS MORE. Don't oversimplify your topic. Be aware that it can be challenging to present a complicated idea in a simple format that uses headings and bullet points. Don't just read the words on each slide. Remember that your audience can read, too. 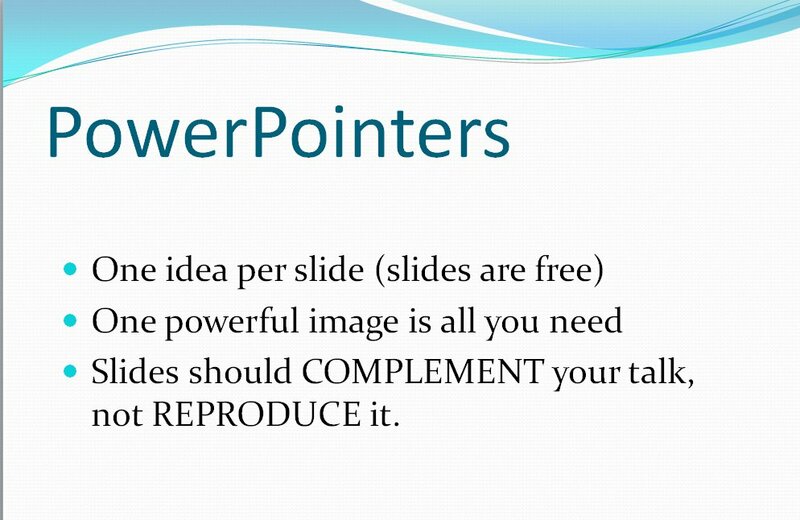 Slides accompany or illustrate your talk; they should not BE your whole talk. Use words on your slides to highlight what is important.